In my usual way I plan to keep these short as I need to get some work done before RI race weekend...and go train! Sterling is traditionally the weekend after Thanksgiving and for 2009 became a 2 day event to fall in line with the other Verge series races. Friday turned out to be a cold and rainy "black" day and I was forced to use my trainer for the first time this season to get my training in. After an hour of hard efforts I prepped the bikes with the Dugast Rhino's and tried to lay low for the rest of the day. Saturday dawned brisk and WINDY!!! (40+mph) but the sun was out so I knew the chance for a dry track was good...I was right! No mud at all! And another great Tom Stevens design using the multi tiered course at Sterling. I got a great jump on the whistle and lead the pack of nearly 75 riders around the cinder track to the run up. after the big run up the selection happened, JB, myself, Roger A and Kevin H. were all to the races. Roger and Johnny were making most of the pulls and I was sitting on. With 3 to go, I got gapped off a bit and had to bridge back on the track, when I made the connection I went to the front so I could lead into the technical sections. This sort of worked to slow down the better bike "drivers" then the attacks started. First Kevin, then Roger and finally Johnny. The elastic snapped and I was left in no mans land at 20sec back. I would finish there for another 4th place. I know on a good day I have the legs to ride with these guys, I just need to be better positioned and take more chances. 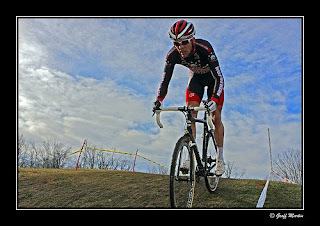 Sunday was a gorgeous day, the warmest I have ever raced at Sterling. No gloves warm! On Sunday I didn't get the same start and was swarmed but a half dozen guys in the first corner. Johnny immediately made a hard effort that would create the winning gap. Roger and Kevin chased hard but I got left behind. I slayed myself for 35+ minutes with the only help coming from Steve P. In hindsight this was a major error as I was just pulling around 5 guys who would go on to out sprint me for 4th. I was pretty pissed on the racing tactics of my other Elite Masters, but I eventually chalked it up to good racing on their part. 9th on the day. I go into the final VERGE race weekend in RI 5th in points, 7 out of 4th. Hopefully the legs will be good and I race to my ability to wrap up the season. Here is a pic from Day 1 in Sterling.